I. 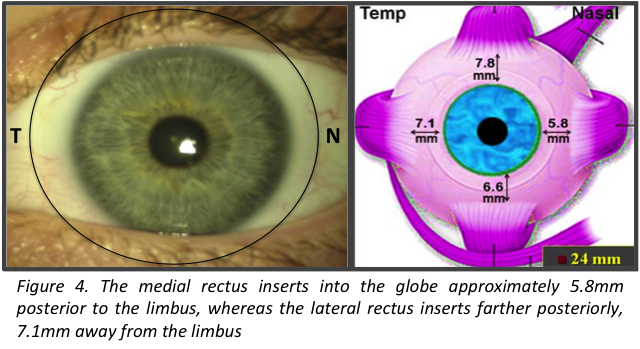 The radius of curvature in the central 3.0mm of the cornea (the “K” readings) has little influence on the overall sagittal depth of the anterior segment. II. The cornea has a measurable radius of curvature across a chord of 10mm. Beyond 10mm, the shape of the peripheral cornea and sclera can best be mathematically described in terms of straight lines or tangents rather than radii of curvature. III. Intra- and inter-ocular asymmetries in scleral shape commonly exist – between the nasal and temporal quadrants of each eye as well as between the right and left eyes themselves. The cumulative impact of these features appears to significantly influence the on-eye positioning of soft contact lenses and, ultimately, the placement of lens optics over the pupil and line-of-sight. In clinical practice, subtle anomalies in the positioning (centration) of soft contact lenses are easily overlooked. Generally, there is little optical consequence when single vision optics are used. However, when fitting more complex (ie. multifocal) optics, lens centration takes on greater importance. Most single vision and multifocal contact lenses are manufactured with their optical center positioned in the geometric center of the lens, yet few lenses that extend beyond the limbus truly center on the eye. We recently measured the horizontal positioning of one brand of daily disposable silicone hydrogel soft contact lenses on 19 normal right and left eyes (Figure 1) and found that the majority of lenses decentered temporally in right eyes and nasally in left eyes. Why do Lenses that Extend Beyond the Limbus Decenter? Based on the medially directed (nasal) forces of the eyelids during blinking, we would anticipate soft contact lenses to decenter nasally, as is the case with most left eyes. Why, then, do we observe significant temporal lens decentration in right eyes, and some left eyes? This may be explained, in part, by the asymmetry we’ve measured between the shape of the nasal and temporal sclera (Figure 2). Our studies have shown that the nasal sclera has a flatter radius of curvature than the temporal sclera, and thus is “higher” in anterior elevation. The average height difference between the nasal and temporal sclera in right eyes was found to be 173um (the nasal sclera was 173um higher than the temporal sclera at an equivalent sagittal depth); in left eyes, the average scleral height difference was only 2um. Another scleral feature we have identified is the presence of a “notch” on the nasal side of the sclera at a chord of approximately 13.0mm (Figure 3). The nasal sclera approaches the peripheral cornea with a relatively flat radius of curvature and then transitions to the (steeper) peripheral cornea, forming the “notch.” There is a greater change in curvature as the nasal sclera transitions into peripheral cornea than there is at the same transition on the temporal side, manifesting as a more dramatic notching of the nasal tissue to accommodate the change. While the nasal “notch” is present on both right and left eyes, it appears to be of greater magnitude in right eyes. We hypothesize that the nasal notch may be related to the position of the medial rectus insertion as compared to that of the lateral rectus (Figure 4). This nasal/temporal asymmetry and related notching play an important role in the positioning of extra-limbal contact lenses. As a soft lens is placed onto the eye, it comes into contact with the highest point on the sclera first (nasal) and subsequently moves in the direction of least mechanical resistance (temporal), ultimately resting where the peripheral curvature most appropriately aligns the lens curvature. 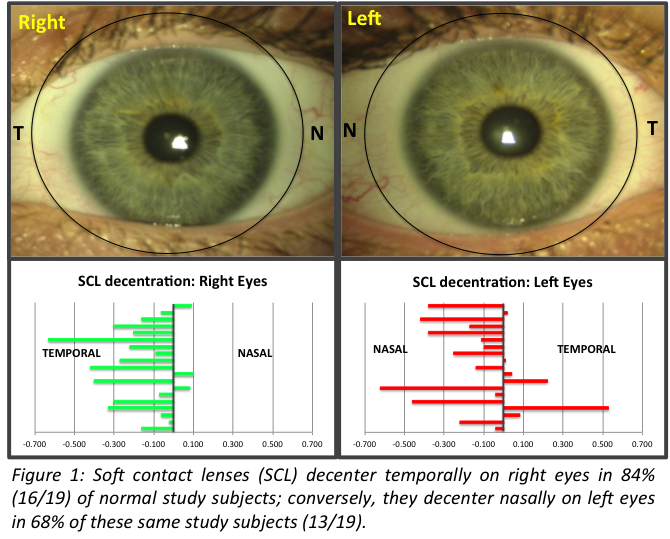 Additional studies will be necessary to better define the origins of the “notch,” and to determine why there appears to be anatomical differences between right and left eyes. The position of the pupil (within the iris) is another important anatomical feature that complicates the positioning of complex multifocal optics on the eye. Studies at Pacific University and other institutions have established that the human pupil is decentered superior nasally in the majority of individuals1-4 (Figure 5). This superior nasal decentration of the pupil is in discord with the temporal decentration of lenses in many eyes (Figure 6); this becomes even more pronounced as the pupil becomes smaller, as in the case of the aging (presbyopic) eye. It is clear that the position of the pupil relative to the contact lens optics is an important characteristic in the performance of multifocal contact lenses. These collective findings are of particular significance for optimal delivery of multifocal optics for aging patients with presbyopia and for children in need of myopia control. As clinicians, it’s important to remember that the central optic zones of most commercially available multifocal lenses are extremely small, approximately 2.0mm. Therefore, proper positioning of the lens optics over the patient’s line-of-sight is critical. So, what can be done about this decentration dilemma? A number of contact lens manufacturers around the world offer the option of lens ballasting with decentration of the multifocal optics, which can be customized for the individual patient (we find the amount of decentration needed is usually between 0.2mm and 0.4mm). Additional work will be required to determine the optimal design to position the complex optics of multifocal lenses effectively over the individual patient’s line-of-sight. As stated earlier, this is important for both the management of presbyopia as well as the control of myopia with multifocal lenses. 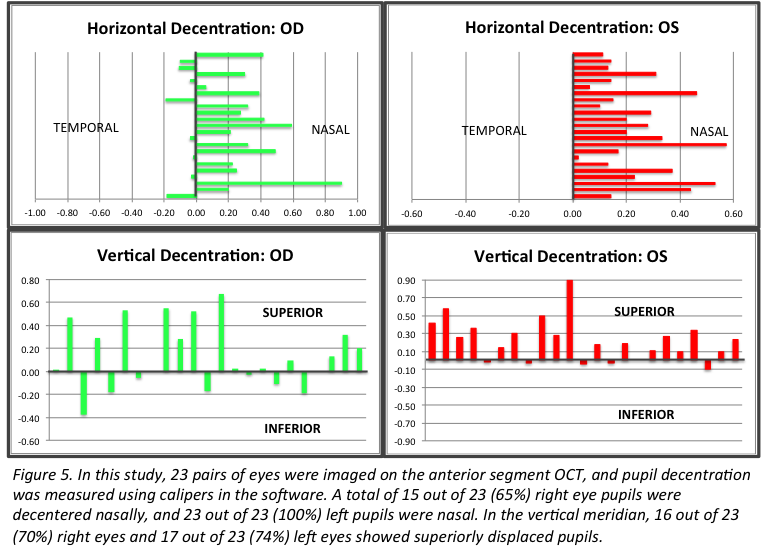 Asano-Kato N, Toda I, Sakai C, Hori-Komai Y, Takano Y, Dogru M, Tsubota K. Pupil decentration and iris tilting detected by Orbscan: anatomic variations among healthy subjects and influence on outcomes of laser refractive surgeries. J Cataract Refract Surg. 2005. 31(10): 1938-42. Tabernero J, Atchison DA, Markwell EL. Aberrations and pupil location under corneal topography and Hartmann-Shack illumination conditions. IOVS. 2009. 50(4): 1964-1970. Yang Y, Thompson K, Burns SA. Pupil location under mesopic, photopic, and pharmacologically dilated conditions. IOVS. 2010. 43(7):2508-2512. 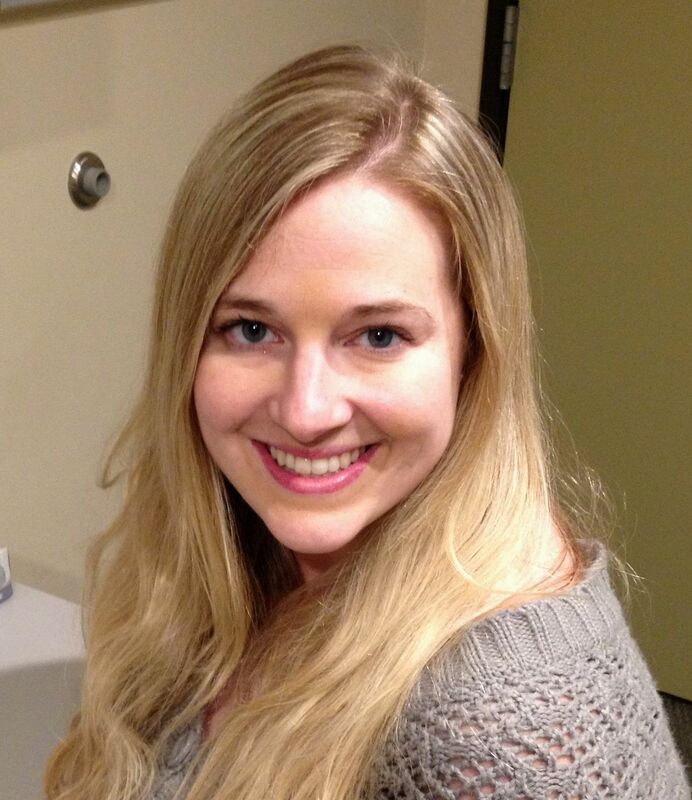 Maria Walker is currently the Cornea & Contact Lens Resident at Pacific University College of Optometry in Forest Grove, Oregon. She received her Doctorate of Optometry and Master’s in Vision Science from The New England College of Optometry in 2013. She is involved in various contact lens research projects at Pacific; her main interests include contact lens optics, corneal physiology, and multifocal lens performance in presbyopia and myopia control. Professor Caroline serves as an instructor and lecturer at the Pacific University College of Optometry in Forest Grove Oregon (USA). He is a Fellow member and Diplomat of the Cornea and Contact Lens Section of the American Academy of Optometry. Patrick is a Council member of the International Society for Contact Lens Research as well as a member of the International Association of Contact Lens Educators and the American Association of Optometric Educators. For the past fifteen years Patrick has served as a contributing editor for the Contact Lens Spectrum and is on the editorial board for Contact Lens and Anterior Eye Journal. He has published over 300 papers on a wide range of contact lens topics and has lectured extensively worldwide.